Plants winter annual, glaucous to nearly green, from somewhat succulent roots. Stems 1-several, erect to prostrate-ascending, (1.5-)2-4(-6) dm. Leaves crowded, compound; blade with 2 orders of leaflets and lobes; ultimate lobes ovate, oblong-elliptic, or obovate, margins incised, apex subapiculate. Inflorescences racemose, (6-)10-16(-20)-flowered, primary racemes slightly to conspicuously exceeding leaves, secondary racemes fewer flowered, exceeded by leaves, cleistogamous-flowered racemes frequently present, 1-5-flowered, inconspicuous; bracts elliptic to attenuate-ovate, 5-8 × 2-4 mm, margins denticulate, distal bracts usually much reduced, those of cleistogamous racemes minute. Flowers erect or spreading; pedicel 2-6 mm; sepals ovate, to 1.5 mm, margins often sinuate or dentate; petals pale to medium yellow; spurred petal slightly to strongly curved, (11-)12-14(-15) mm, spur straight, 4-7 mm, apex obtuse or ± globose, crest low, wrinkled, rarely obsolescent, marginal wing well developed, sometimes revolute, unspurred outer petal slightly bent, 9-11 mm, crest low; inner petals oblanceolate, 7-10 mm, blade apex 2 times or more wider than base, basal lobes obscure, claw 3-4 mm; nectariferous spur straight or curved, sometimes clavate, ca. 3/5 length of petal spur; style ca. 4 mm; stigma rectangular, 2-lobed, 1/2 as long as wide, with 8 papillae. Capsules erect, linear, slender, straight to slightly incurved, 10-35 mm, essentially glabrous, usually shorter in cleistogamous-flowered racemes. Seeds ca. 1.5 mm diam., concentrically and minutely decorated, marginal ring absent. 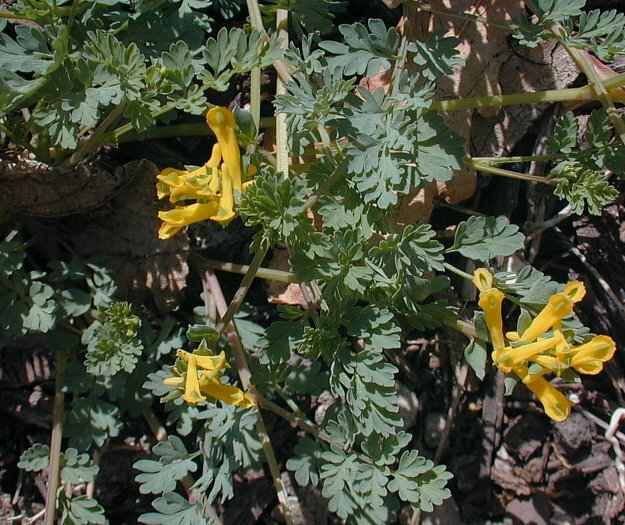 Corydalis micrantha can be distinguished readily from other yellow-flowered North American species by its very small seeds. Cleistogamy is encountered regularly in C . micrantha . A single plant from any part of the range may have only cleistogamous flowers, only chasmogamous flowers, or both types. Plants having only cleistogamous flowers usually are much more profusely and delicately branched. In C . micrantha , at least, shade and age appear to play roles in the initiation of cleistogamy. Erect or ascending annual, 1-3 dm, glaucous or nearly green; racemes usually well surpassing the lvs; bracts narrowly lanceolate; cor pale yellow, 11-15 mm, incl. the 4-6 mm spur; crest of the upper pet low, entire; frs ±erect, 1-1.5(-2) cm; often some or all fls cleistogamous, these 1-5 in a raceme, inconspicuous, often with smaller fr; seeds ca 1.5 mm wide, without a ring-margin; 2n=16. Moist, especially sandy soil; Ill. to s. Minn. and S.D., s. to the Gulf, and n. along the Atlantic coast to N.C. Our plants are var. micrantha. Vars. australis and texensis are more southern.